After traveling through the the solar system for nearly four years, NASA's Dawn spacecraft is poised to arrive in orbit around Vesta, a huge asteroid the size of Arizona. The historic event is set to take place at about 10 p.m. PDT Friday, July 15 (1 a.m. EDT July 16), NASA officials said. But the arrival at Vesta is only one stop in the long road for the Dawn spacecraft. The spacecraft launched in September 2007 and has logged about 1.7 billion miles (2.7 billion kilometers) since, propelled by its super-efficient ion propulsion system. After spending a year at Vesta, Dawn will head off to study the dwarf planet Ceres, the largest object in the asteroid belt. Dawn's $466 million mission is aimed at comparing Vesta and Ceres to help scientists learn about the early days of the solar system and the processes that formed and shaped rocky planets like Earth and Mars. As Dawn's Vesta rendezvous looms, SPACE.com caught up with Dawn project manager Robert Mase of NASA's Jet Propulsion Laboratory in Pasadena, Calif. Mase discussed the upcoming orbital encounter, Dawn's ultimate fate and the challenges of planning a mission to a mostly unknown solar system body. SPACE.com: Will you be able to tell right away that you're in orbit around Vesta? Or will it take a while to hear from Dawn? Robert Mase, project manager of NASA's Dawn mission at the agency's Jet Propulsion Laboratory in Pasadena, Calif.
Robert Mase: We're different than your typical mission, and your typical planetary encounter. We spend most of the time thrusting with the ion engine, which means that we're not communicating with the spacecraft. Our antenna is at a fixed position on the spacecraft, and if we're pointed to our thrust attitude, that means we're generally not pointing the antenna at Earth. We'll actually be thrusting [Wednesday] night through early Sunday morning. So for all of that time, we will not be in contact with the spacecraft, and then we'll have a planned contact on Sunday morning. That's the first point where we can confirm that we thrusted the way that we expected to, and that we actually are captured [by Vesta]. SPACE.com: So if everything goes according to plan, will you guys have a little party Sunday morning? Or will it just be business as usual? Mase: It'll be more business as usual for us than you would think. First of all, it's Sunday. While there will be a few people in to check on the spacecraft, the bulk of the team is not going to be working on Sunday. But we'll be back to work on Monday. So perhaps we'll have a small celebration then. In most planetary encounters, the spacecraft comes zipping up to the body, does a propulsive burn that lasts for half an hour or an hour or something like that, then is captured into orbit. It's a critical event — it's gotta happen, or else you just fly right on by. With us, we're truly rendezvousing with Vesta. Maybe one way to think about it is the way the space shuttle might rendezvous with the space station. We're in an orbit that's very similar to Vesta's now around the sun. We're basically just pacing it at this point. We're approaching very slowly. We just need to keep thrusting and then eventually we get to the point where technically we're captured. SPACE.com: So this capture event isn't absolutely critical — if things don't work out, you could just try again soon? Mase: Yes. And that’s the flexiblity that the ion propulsion provides. We do have the ability to catch up if we end up falling behind. We're never at a point where we just fly on by and that's it. SPACE.com: You've been chasing Vesta down for nearly four years, and now you're almost there. It must feel pretty good. Mase: Yeah, absolutely. It's been a long journey, but a very worthwhile journey. And the team is very excited. We've got a team that's not only here at JPL doing the bulk of the engineering operations, but a team of scientists around the country and around the globe. We've got instrument partners in Italy and Germany, so it's truly an international collaboration that has worked on this for a long time. SPACE.com: What's it like working on these deeper space missions, where it can take years to reach your target? Is there a lot of downtime? Mase: It would seem that way, but actually we're remarkably busy the whole way. You can kind of split the whole concept into two parts. There's the part where you're developing, you're building the spacecraft and just getting it to the launch pad. That takes several years, but it's a pretty fast pace all the way. When we get there, we get into a high altitude, kind of reconnaissance orbit. Then it takes about a month to spiral down into our intermediate altitude orbit, and then about another month and a half to spiral down to our lowest altitude orbit. So we'll be at three altitudes. And then we'll have to spiral back up and out. Planning out how that's going to happen on a day-by-day, almost hour-by-hour basis for a year — you can imagine there are a lot of details to plan out. That's what we've been doing for the last several years: figuring out exactly what we're going to do, how we're going to do it and what types of contingencies we're going to have in place. SPACE.com: Three different orbits around a single object seems pretty unusual. Most spacecraft don't get three different looks at a single object from orbit. Mase: That's right. And again, that's some of the flexibility that we're afforded by the ion propulsion system. A lot of these planetary encounters, they just fly by, and you get one shot at it and that's about it. Or, some of the ones that do go into orbit — it's pretty expensive, from a propulsion standpoint, just to get into orbit. So typically it's very difficult to carry that much chemical propellant, to be able to change from one orbit to another. But with the ion propulsion system, you have that capability. And while it takes a while — a month to a month and a half to transition between these orbits — it's not expensive in terms of propellant, so you can afford to do it. It's a flexibility and a capability that we have that is just not available with other, more conventional chemical systems. SPACE.com: What are you most looking forward to finding out in this mission, or what is most exciting to you? Mase: What's exciting for me is that we're going someplace that no one has gone before. We're seeing things that nobody has seen before. We're doing a lot of firsts, and a lot of true exploration. So I find that aspect of it exciting. I've worked on plenty of other missions that have gone to Mars and other places. Great missions, and they're exciting. But it's going to Mars— a place we know pretty well, and we kind of know what to expect. 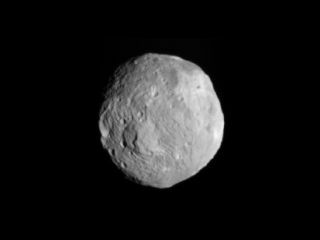 But with this one, nobody knows much about Vesta or Ceres. The best images we have are these fuzzy images from Hubble that just sort of hint at what it's going to look like. So being able to go to a place that nobody's seen before, nobody's explored — to me, that's the most exciting part of this mission. SPACE.com: NASA is aiming to send an astronaut to an asteroid by 2025. Do you see Dawn's mission as helping out in that longer-term goal for manned spaceflight? Mase: There may be some lessons from Dawn that could be applied to the manned program. Some of the goals of the human program are a little different. They wouldn't be going to the asteroid belt, and they would probably be going to different types or sizes of bodies perhaps than we're going to. But at the same time, we are learning how to use ion propulsion systems effectively and capably, to be able to rendezvous with these bodies. SPACE.com: What have some of the biggest challenges with this mission been? You're doing some new things, and going to a new type of object that we haven't seen probes going to in the past. Mase: Yes. And I think you kind of hit it right on the head. That is one of the biggest challenges: We don't know very much about these bodies, Vesta or Ceres. Most encounters that we've planned with past missions — like to Mars or Mercury or other planets — we've always had at least a flyby or something that's gone ahead of an orbiter or a lander to be able to do some kind of reconnaissance. If you can fly by, you can pretty well determine the gravity and the spin axis, and all the kinds of things you need to know about the body to be able to operate about it. That's something that we don't have here. Nobody's ever been by Vesta before, so we don't know all of those things as well as we usually do. And so that's a challenge, in terms of figuring out how to do it and also in putting together a mission plan that can accommodate a range of expected values. SPACE.com: After a year at Vesta, then it's on to Ceres in July 2012. Mase: That's right. Next year we spiral out, sort of the opposite of capture. And at that point we're in orbit around the sun again. We thrust for about 2 1/2 years to go a little bit farther away from the sun, to get out to Ceres. We actually get there in about February of 2015. Then we'll do the same type of operation at Ceres. We'll approach and capture, then spiral in — start at a high altitude orbit, then spiral down to some lower orbits. The difference there is, once we're at Ceres, we don't have to leave again. We just stay in orbit there. SPACE.com: Is that Dawn's ultimate fate? Circling Ceres until everything goes dark for the probe? Mase: Most likely. We certainly have enough of all of our spacecraft consumables to get there. If we have something left, somebody may come up with a bright idea to depart and try to do something else. But the primary mission as proposed is, we get into orbit around Ceres, do all the good science there and then the mission formally ends in orbit at Ceres.